Avery Point Lighthouse is cared for by the Avery Point Lighthouse Society, a chapter of the American Lighthouse Foundation. Built in 1944, this gray, octagonal-shaped, concrete structure owned by the University of Connecticut was once slated for demolition. 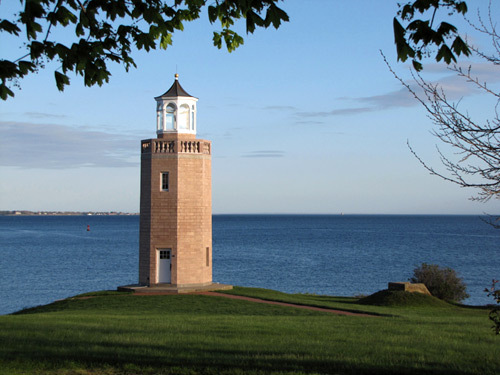 Through a cooperative agreement, ALF and its Avery Point Lighthouse Society chapter raised the necessary funds and completed a $500,000 restoration in 2006. The lighthouse was relit as a private aid-to-navigation on October 15th, 2006. Description: Gray, octagonal-shaped, concrete structure. Status: After being discontinued in 1967, the lighthouse was relit as a private-aid-to navigation in 2006. A solar powered LED optic serves as the current light source with a characteristic of a green flash every 4 seconds. The lighthouse was completely restored and is now preserved under a maintenance schedule. The lighthouse is located on the grounds of the University of Connecticut’s Avery Point Campus in Groton, CT and are open to the public. There is a memorial walkway that provides an enjoyable walk along the shoreline and leads up to the lighthouse tower. Enjoy views of the entrance of the Thames River as well as New London Ledge Lighthouse and New London Harbor Lighthouse.